Above: Harry Cording in King of the Royal Mounted (Republic, 1940). Primarily a feature-film player, the burly and formidable Harry Cording only appeared in a handful of serials, and only played major roles (the chief henchman) in two of them. His cliffhanger work may have been scanty, but it was first-class; his henchmen were some of the most threatening thugs seen in any chapterplays. Many serial goons seemed merely workmanlike in their attitude towards villainy, obediently ruthless but not as malignant as their principals. Cording, however, played his heavies in a scowling, viciously angry manner that made them a good deal more frightening then the leading villains. Cording was born Hector William Cording in Murree, India, the son of a British soldier. He served in the army himself from 1910 to 1919, doing duty as an artillery gunner during the first World War. Following the end of the war, he sailed from England in late 1919, arriving in America in 1920. It’s uncertain when he decided to take up acting as a career; the censuses don’t find him in Hollywood until 1930, but he had made his screen debut there five years earlier, in a silent boxing/lumberjack film called The Knockout. Cording played a heavy in this film, setting the tone for the rest of his career, and followed it up with large and small villainous parts in other silent films. Ernst Lubitsch’s 1928 Oscar-winning costume drama The Patriot (one of the most sought-after “lost” films), gave him one of his biggest silent-era roles as the traitorous Cossack Stefan, but most of his other silent roles would be in less lavish films, chiefly outdoor adventure pictures. The arrival of sound won Cording frequent work as a character player in films with historical or foreign settings; his British accent fit such milieus better than the American twangs of other performers did. Most of his roles were small and uncredited during the first half of the 1930s, but the later years of the decade saw him playing some major villainous parts in several of George O’Brien’s RKO B-westerns, as well as taking a noticeable role as Basil Rathbone’s henchman in Warner Brothers’ The Adventures of Robin Hood. Cording’s first serial was the 1940 Republic Pictures release King of the Royal Mounted. One of the studio’s best serial, Mounted featured Allan Lane as a RCMP sergeant battling a gang of Nazi spies bent on smuggling a vital chemical compound out of Canada. Cording played Wade Garson, the spies’ chief field agent, who established his villainous bona fides by grimly gunning heroine Lita Conway’s father (Stanley Andrews) in Chapter One. Garson continued on his nasty path, until being plugged by the heroine’s brother (Robert Kellard) in Chapter Ten. Cording played Garson in a hard-bitten, coldly furious manner, only dropping his bushy-browed scowl to engage in harsh, sardonic laughter at his enemies’ expense. 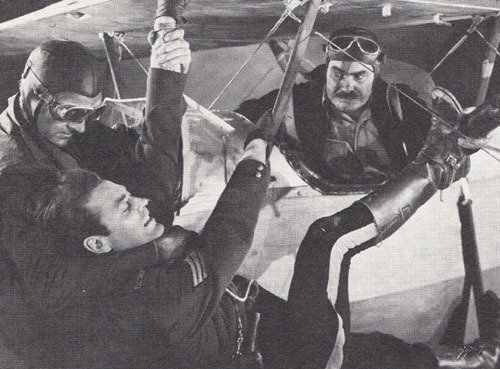 Above: Ted Mapes and Harry Cording attempt to shove Allan Lane out of an in-flight airplane in King of the Royal Mounted (Republic, 1940). 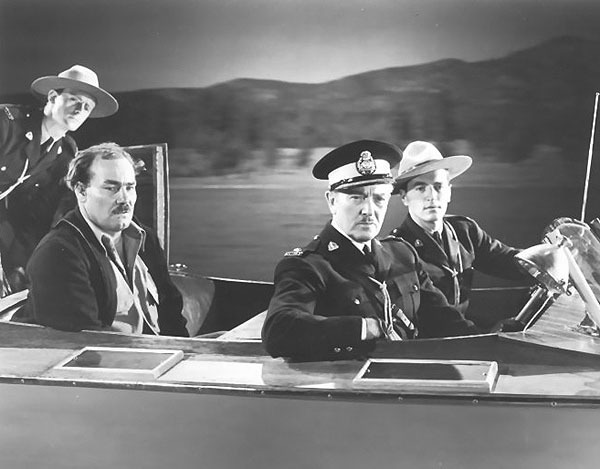 Above: Harry Cording is in Mountie custody in King of the Royal Mounted (Republic, 1940). That’s Herbert Rawlinson in the peaked cap, Richard Simmons at the wheel of the boat, and Wallace Reid Jr. behind Cording. The 1940s saw Cording working chiefly at Universal Pictures, playing supporting (and usually villainous) roles of varying size in almost all of their horror films, Arabian Nights pictures, and Sherlock Holmes movies, as well as several of their B-westerns. His remaining serials would be Universal productions as well, beginning with The Green Hornet Strikes Again (1940). This chapterplay only gave him one extended scene, as a crooked construction foreman named Dannick who was engaged in the sabotage of a rival company’s building. 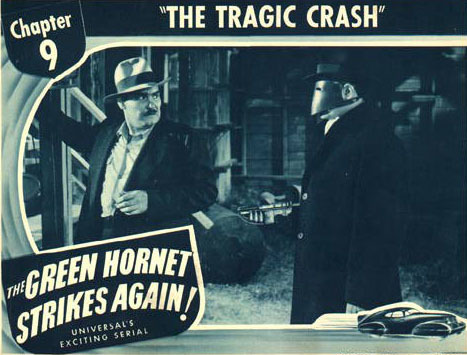 The Green Hornet (Warren Hull) caught Dannick in the act and tried to get him to name his leader, but both men were engulfed in an explosion set by Dannick’s associates; Cording’s character did not survive. Above: Harry Cording and Warren Hull in The Green Hornet Strikes Again (Universal, 1940). The excellent Western serial Overland Mail (Universal, 1942), featured Cording in his second and last big cliffhanger role. 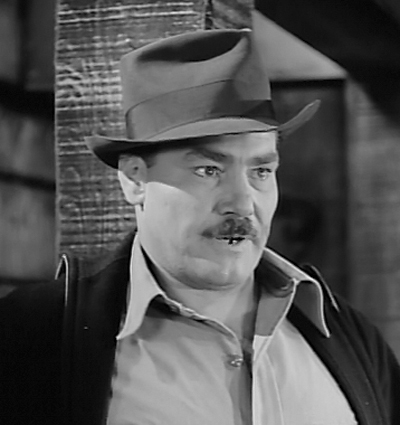 In this outing, he played outlaw Sam Gregg, one of the leading accomplices of crooked frontier businessman Noah Beery Sr. Cording and his cohorts carried out repeated raids against a stage line that Beery hoped to put out of business, but the gang was stopped by Lon Chaney Jr. Cording was suitably menacing as the ferocious Gregg, looking frightening even when disguised in rather unsuitable Indian costume. Cording capped his sinister performance with one of the most memorable villainous death scenes in a serial. After being wounded in a gun battle, he was ministered to by Chaney. After thanking the hero for his kind treatment, Cording asked mildly, “I suppose you expect me to talk?” but then roared “Well, I won’t!” before expiring, mean to the end. 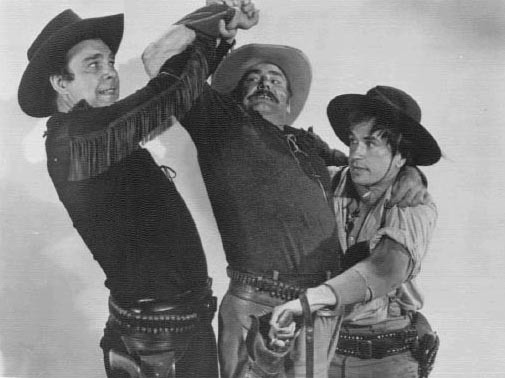 Above: Lon Chaney Jr. and Noah Beery Jr. fight Harry Cording in Overland Mail (Universal, 1942). 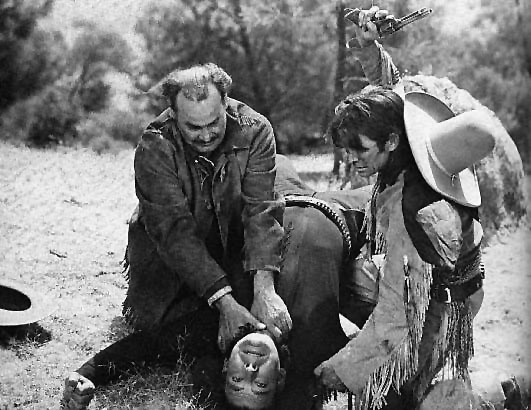 Above: Harry Cording and Charles Stevens give Lon Chaney Jr. a rough time in Overland Mail. Cording only appeared in two more serials, the first of which was The Great Alaskan Mystery (1944). He was prominent in the first three chapters of this World War 2 espionage tale, as a brutal ship captain named Greeder who was working with German agent Martin Kosleck. Cording dropped out of sight in Chapter Four, however, and never received an on-screen comeuppance for his actions, which included hurling a suspected government agent overboard. 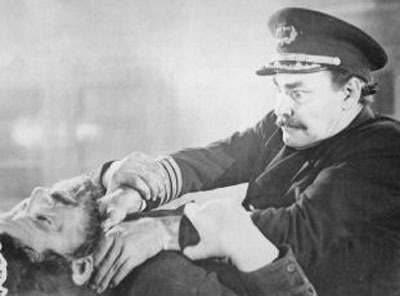 Cording had played a very similar role in the 1941 Universal feature Mutiny in the Arctic, and it’s possible that Universal assigned him to play Greeder principally to match stock footage from the earlier (largely ship-bound) film—which would explain his absence after the serial’s storyline left Greeder’s vessel. 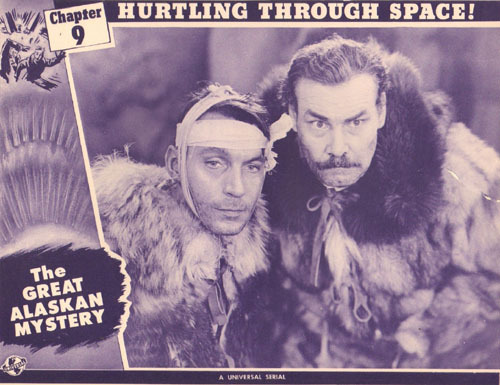 Above: Martin Kosleck and Harry Cording in The Great Alaskan Mystery (Universal, 1944). Cording’s last serial was another WW2-themed cliffhanger, Jungle Queen; here, he made a brief appearance as an unnamed sailor in the pay of yet another group of Nazi agents, and tried to drop a heavily-loaded cargo net on hero Edward Norris before disappearing from the scene. He would continue appearing in features for Universal and other studios throughout the 1940s, working—as during the 1930s—principally in swashbucklers and other films set either in the past or in foreign countries. He appeared in a few TV Westerns (Hopalong Cassidy, Wild Bill Hickok) in the early 1950s, but mostly stuck to feature films, continuing his character-acting career right up until his death. His final role (once again as a sardonic henchman) came in the 1954 Bowery Boys comedy Jungle Gents, which was released only four days after Cording passed away in Sun Valley, California. Harry Cording is probably best-remembered by film buffs for his contributions to films like Adventures of Robin Hood and the Sherlock Holmes series. However, his serial performances, few though they were, entitle him to the attention of serial buffs as well. Due to the increasing exposure given to King of the Royal Mounted (long unavailable to the general public) and Overland Mail (until recently only available in inferior prints), Cording has of late become better-known to serial fans than in years past—and deservedly so. His hulking, ruthless, hard-faced heavies in those two chapterplays were more menacing than half the henchmen played by other performers of longer serial tenure. Above: Harry Cording throttles Jack Clifford with characteristic intentness in The Great Alaskan Mystery (Universal, 1944). Acknowledgements: My special thanks to John Cording for providing me with genealogical information on his second cousin once removed, Harry Cording, and helping me to expand this article. Thank you. I agree that Cording played his roles with a careful balance and shaping of each one. He didn’t simply walk on, scowl and leave. He must have taken some pride in these humble parts. His flexibility can be seen in the several characters in the Holmes’s series, even when they were only a few minutes long: the coffin-maker, pottery-shop owner, etc. Each one is different, each one realistic. Harry Cording’s height is commonly given as 6 feet. There are multiple instances of him directly adjacent to 6′ 1″ Rathbone in the Holmes’ series and he can be no less than 3 inches shorter. He was a maximum 5’10”. http://www.youtube.com/watch?v=R-N-PAsJ9pU 55:12 Rathbone, Dennis Hoey, Cording.